Finding Organic products is really difficult in a small town. Then when you do find it, the taste is less than desirable. I have now found Earthbound Organic. It is delicious. I can really tell a difference in eating Organic Food. It tastes fresher, crisper, And I just feel better about eating organic. For nearly 30 years Earthbound Organic has been saying NO to synthetic pesticides and fertilizers, to GMO's, to irradiation , and NO to hormones, antibiotics, artificial ingredients and trans fats. When you commit to grow organically you are committing to working with nature not against it. Organic farming means they're not bringing home toxic chemicals on their clothes and shoes that could harm their families. It also means they're protecting the environment. Earthbound Farm is the country's largest grower of organic produce, committed to being a catalyst for positive change in our kitchens and our environment. You can find Earthbound Farm Organic products at most retail stores. 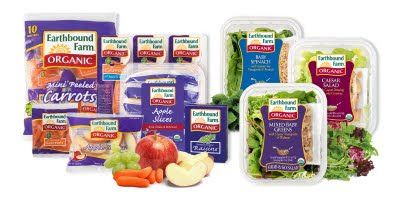 Earthbound Farm Organic carries Salads, Vegetables, Frozen Fruit,Herbs, Fruit,Frozen Vegetables, Dried Fruit, & Snacks. 4. just say "NO" to PAPER & PLASTIC BAGS-use a recyclable one.